innovatively integrated into Stockholm Royal Seaport. 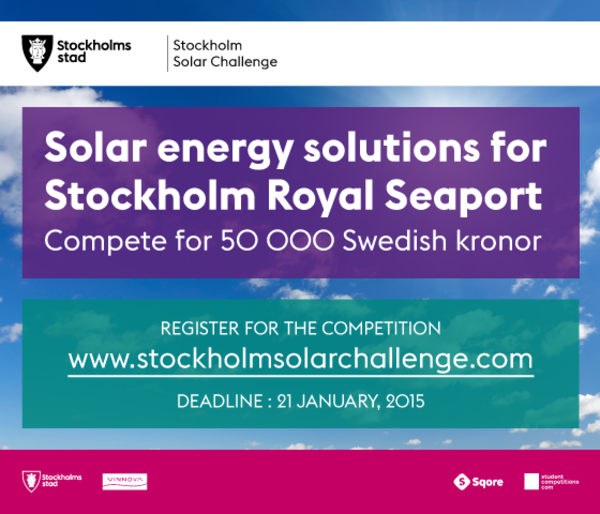 The solution should provide energy for functions within the city but also be a trademark of Stockholm Royal Seaport. The jury, consisting of experts within the area, will judge the entries on a variety of criteria, such as feasibility, visual appeal, cost-efficiency, innovativeness and longevity. reducing resource consumption and climate impact, as well as visualizing it in an educational and aesthetic way, says Christina Salmhofer, Sustainability Manager for the City of Stockholm. The winner of the competition will be awarded with 50 000 Swedish kronor and the possibility to see their idea become reality in Stockholm Royal Seaport. Do you want to send information about the challenge in your network? Download the marketing kit for the competition. An innovation challenge is a powerful tool to engage customers and citizens in your organization. By opening up your challenges and searching for opportunities outside your own organization you will be able to identify novel ideas while also building a community of innovators and entrepreneurs. The competition format is ideal for developing products/services, recruit competence and promote your brand. You attract the best talents and award the best ideas. Contact us at Sqore to learn more about innovation challenges and how they can be used within your company or organization. Stockholm Royal Seaport will hold 12 000 new apartments and 35 000 new workplaces and will be completed 2030. It´s one of the larges developing projects in Europe.The largest port in Stockholm for passenger and cruise-ships are right in the middle of this new urban district. The Baltic Sea starts to the east of the city district. Together with all the green parks, these are values that gives Stockholm it’s unique open character. For more information and application details, follow this link to visit the official website for the Stockholm Challenge. The deadline for application is 21 January 2015.